Over the years I’ve seen an increase in the number of clients, that I help deal with anxiety, but very few actually know what anxiety actually is. I see people of all ages from all walks of life, who are affected by anxiety. General anxiety that often comes completely out of the blue, or for no obvious reason, to elite professional performers who suffer from performance anxiety. Anxiety if often very silent and no-one other than the person affected is aware (and sometimes the people close to them). I’ve been fortunate to work with some amazing people of the years, some of which are household names and well known in their profession, and to the onlooker watching them on stage or as they step out on to the pitch, the onlooker wouldn’t be aware of what’s going on inside the persons mind or body! I tell you this, because quite often anxiety is like a secret club, with countless members, yet the person experiencing it feels like they’re on their own. So, one of the first things I’ve found most people find beneficial, is to understand what anxiety actually is. Often when client have been diagnosed as suffering anxiety, they don’t actually know what it is, so in this case knowledge is empowering. Once they have a greater understanding and awareness, they can then go on to deal with it more effectively. I’ve lost count of the number of times I’ve heard, that’s me, that’s exactly what happens, it’s such a relief to know it’s real and I’m not going crazy. 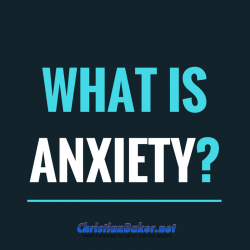 Anxiety is often described as a feeling of worry, nervousness, or unease about something or some situation. When we experience fear it creates physical and chemical changes within the body. As Hormones are triggered and released into the body, blood is sent to vital organs and muscles, putting the body into a state of alert. This can cause a number of bodily sensations such as tension, tight muscles, increased breathing rate, and change in temperature, perspiration, palpitations, dizziness, nausea, tight throat, and dry mouth. What is happening is a natural bodily response, where the body is saying, “Come on then, I’m ready to fight or flight”. As this is a primitive response that we no longer have to utilize on a daily basis, like our primitive ancestor’s (think cavemen), we don’t know how to respond emotionally, or physically, so we panic and see Stress or Fear as a negative response. One thing we can do is change some of the stress triggers if possible, but often we can’t change them, or sometimes we don’t even realise what they are, as stress can also be very silent for many of us, we don’t always realise we are experiencing this response. So often we can change these triggers, but ultimately the one thing we are in control of, is the way we respond to them. Become aware of any of your anxiety triggers… look at how you can stop/change or avoid them. And then look at some of your lifestyle habits and look at ways you can incorporate more lifestyle strategies that help you to relax and unwind and release the stress response. We’re all different, so explore what works for you. Coming up in a future video I’ll share with you 3 simple and effective ways to manage & overcome anxiety. So make sure you click subscribe, to get all future episodes. Thanks for watching and remember – What your mind believes you will achieve – so think differently, believe in yourself, take action and achieve the life you want!